Beverly creates lo-tech, artful and useful ceramics with a wiggle. The forms are well-balanced, comfortable and unexpected with a little added playfulness. She produces functional pottery, limited editions and one-of-a kind ceramics for galleries, restaurants, wineries and collections throughout the country. She graduated from the University of Georgia with an MFA in Ceramics and immediately moved to California. In 1970 she chose Sonoma Valley as her home. Five years later, after years of teaching ceramics, she began her business and has been self-employed since then. She is a founding member of the Arts Guild of Sonoma and the Sonoma Valley Jazz Society. 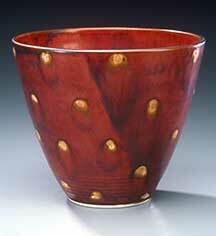 In 1998, she was chosen the Artist Treasure of the City of Sonoma, an honor given to one local clay artist each year. She is a member of the Baulines Craft Guild aka California Contemporary Craft Association and the Association of Clay & Glass Artists of California. Every piece, functional or sculptural, is individually handmade, the original form often being altered so it will develop its own character. She enjoys the challenge of combining form, surface and function into a satisfying object that is a pleasure to use.